Beheshtinia, M., Nemati-Abozar, V. (2017). A Novel Hybrid Fuzzy Multi-Criteria Decision-Making Model for Supplier Selection Problem (A Case Study in Advertising industry). Journal of Industrial and Systems Engineering, 9(4), 65-79. Mohammadali Beheshtinia; Vahid Nemati-Abozar. "A Novel Hybrid Fuzzy Multi-Criteria Decision-Making Model for Supplier Selection Problem (A Case Study in Advertising industry)". Journal of Industrial and Systems Engineering, 9, 4, 2017, 65-79. Beheshtinia, M., Nemati-Abozar, V. (2017). 'A Novel Hybrid Fuzzy Multi-Criteria Decision-Making Model for Supplier Selection Problem (A Case Study in Advertising industry)', Journal of Industrial and Systems Engineering, 9(4), pp. 65-79. Beheshtinia, M., Nemati-Abozar, V. A Novel Hybrid Fuzzy Multi-Criteria Decision-Making Model for Supplier Selection Problem (A Case Study in Advertising industry). Journal of Industrial and Systems Engineering, 2017; 9(4): 65-79. Choosing the proper supplier has a critical role in design of supply chain. This problem is complicated because each supplier may fulfills some of the manufacturer criteria and choosing the best supplier is a Multiple-Criteria Decision Making problem. This paper proposes a novel hybrid approach to rank suppliers in advertising industry and considers two new criteria to evaluate the suppliers in the industry. The proposed approach combines Modified Digital Logic (MDL) and Technique for Order of Preference by Similarity to Ideal Solution (TOPSIS) using fuzzy theory. At the end, the results of the proposed approach is compared with a hybrid method using Fuzzy Analytical Hierarchy Process (FAHP) and Fuzzy TOPSIS on a real case study. Aksoy, A.Öztürk, N. (2011). Supplier selection and performance evaluation in just-in-time production environments. Expert Systems with Applications, 38(5), 6351-6359. Arikan, F. (2013). A fuzzy solution approach for multi objective supplier selection. Expert Systems with Applications, 40(3), 947-952. Bellman, R. E.Zadeh, L. A. (1970). Decision making in a fuzzy environment. Management Science, 17(4), 141-164. Bhattacharya, A., Geraghty, J., & Young, P. (2010). Supplier selection paradigm: An integrated hierarchical QFD methodology under multiple-criteria environment. Applied Soft Computing, 10(4), 1013-1027. Bilbao-Terol, A., Arenas-Parra, M., Cañal-Fernández, V., & Antomil-Ibias, J. (2014). Using TOPSIS for assessing the sustainability of government bond funds. Omega, 49(1-17. Bruno, G., Esposito, E., Genovese, A., & Simpson, M. (2016). Applying supplier selection methodologies in a multi-stakeholder environment: A case study and a critical assessment. Expert Systems with Applications, 43(271-285. Büyüközkan, G.Çifçi, G. (2012). A novel hybrid MCDM approach based on fuzzy DEMATEL, fuzzy ANP and fuzzy TOPSIS to evaluate green suppliers. Expert Systems with Applications, 39(3), 3000-3011. Chen, P.-S.Wu, M.-T. (2013). A modified failure mode and effects analysis method for supplier selection problems in the supply chain risk environment: A case study. Computers & Industrial Engineering, 66(4), 634-642. Chen, Z.Yang, W. (2011). An MAGDM based on constrained FAHP and FTOPSIS and its application to supplier selection. Mathematical and Computer Modelling, 54(11–12), 2802-2815. Dursun, M.Karsak, E. E. (2013). A QFD-based fuzzy MCDM approach for supplier selection. Applied Mathematical Modelling, 37(8), 5864-5875. Fadavi, A., Servati-Khangah, A., & Nazari-Asli, M. (2013). A hybrid model for supplier selection in outsourcing: Evidence from Shima Film Company in Iran. Research Journal of Applied Sciences Engineering and Technology, 5(12), 3298-3305. Galankashi, M. R., Helmi, S. A., & Hashemzahi, P. (2016). Supplier selection in automobile industry: A mixed balanced scorecard–fuzzy AHP approach. Alexandria Engineering Journal, 55(1), 93-100. Hashemi, S. H., Karimi, A., & Tavana, M. (2015). An integrated green supplier selection approach with analytic network process and improved Grey relational analysis. International Journal of Production Economics, 159(0), 178-191. Hugos, M. (2003). Essentials of supply Chain Management: John Wiley & Sons Inc.
Kannan, D., Jabbour, A. B. L. d. S., & Jabbour, C. J. C. (2014). Selecting green suppliers based on GSCM practices: Using fuzzy TOPSIS applied to a Brazilian electronics company. European Journal of Operational Research, 233(2), 432-447. Kannan, D., Khodaverdi, R., Olfat, L., Jafarian, A., & Diabat, A. (2013). Integrated fuzzy multi criteria decision making method and multi-objective programming approach for supplier selection and order allocation in a green supply chain. Journal of Cleaner Production, 47(0), 355-367. Kilincci, O.Onal, S. A. (2011). Fuzzy AHP approach for supplier selection in a washing machine company. Expert Systems with Applications, 38(8), 9656-9664. Lee, A. H. I. (2009). A fuzzy supplier selection model with the consideration of benefits, opportunities, costs and risks. Expert Systems with Applications, 36(2, Part 2), 2879-2893. Lima Junior, F. R., Osiro, L., & Carpinetti, L. C. R. (2014). A comparison between Fuzzy AHP and Fuzzy TOPSIS methods to supplier selection. Applied Soft Computing, 21(0), 194-209. Makui, A., Gholamian, M. R., & Mohammadi, S. E. (2015). Supplier selection with multi criteria group decision making based on interval valued intuitionistic fuzzy sets (Case study on a project based company). Journal of Industrial and Systems Engineering, 8(4), 19-38. Qian, L. (2014). Market-based supplier selection with price, delivery time, and service level dependent demand. International Journal of Production Economics, 147, Part C(0), 697-706. Rahmani, M.Ebrahimi, B. (2015). A multi-criteria decision making approach for priority areas selection in membrane industry for investment promotion: a case study in Iran Marketplace. 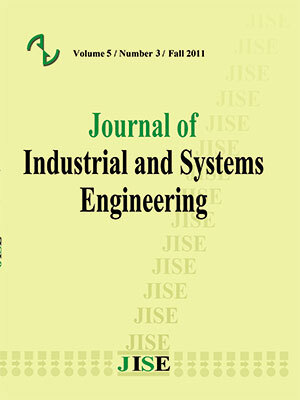 Journal of Industrial and Systems Engineering, 8(1), 41-61. Rezaei, J., Fahim, P. B. M., & Tavasszy, L. (2014). Supplier selection in the airline retail industry using a funnel methodology: Conjunctive screening method and fuzzy AHP. Expert Systems with Applications, 41(18), 8165-8179. Saaty, T. L. (2008). Decision making with the analytic hierarchy process. International Journal of Services Sciences 1(1), 83-98. Safa, M., Shahi, A., Haas, C. T., & Hipel, K. W. (2014). Supplier selection process in an integrated construction materials management model. Automation in Construction, 48(0), 64-73. Sanayei, A., Farid Mousavi, S., & Yazdankhah, A. (2010). Group decision making process for supplier selection with VIKOR under fuzzy environment. Expert Systems with Applications, 37(1), 24-30. Taylan, O., Kabli, M. R., Saeedpoor, M., & Vafadarnikjoo, A. (2015). Commentary on ‘Construction projects selection and risk assessment by Fuzzy AHP and Fuzzy TOPSIS methodologies’ [Applied Soft Computing 17 (2014): 105–116]. Applied Soft Computing, 36(419-421. Yücel, A.Güneri, A. F. (2011). A weighted additive fuzzy programming approach for multi-criteria supplier selection. Expert Systems with Applications, 38(5), 6281-6286.